Although dentures are an option for the fully edentulous patient, over time bone structure will change due to lack of stimulation to bone. 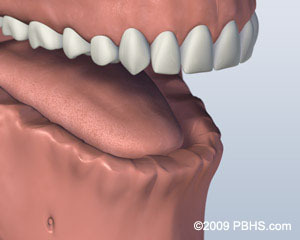 This will require patients to have the dentures adjusted and or have a completely new set made. At West Coast Oral and Maxillofacial Surgery Center there are several options that patients can choose for implant-supported restorations to alleviate the bone loss associated with wearing dentures. 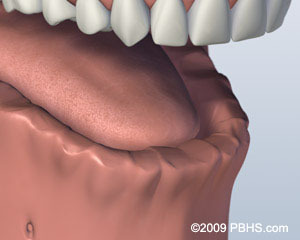 Using attachments to support a denture involves placing two to six implants into the jaw bone. 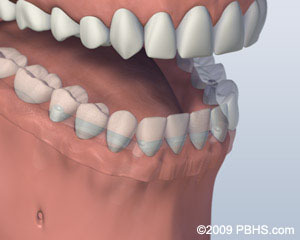 The number of implants are determined by the structure and dimensions of the jaw. After osseointegration is achieved with dental implants, patients can proceed with fabrication of the definitive restoration. This restoration is accomplished by having a custom-made bar connected to the implants. 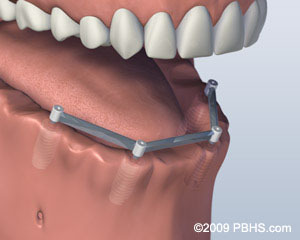 The denture is then fabricated with custom clips that attach to the implant supported bar allowing the denture to snap into place, this is called an “overdenture.” A bar attachment denture is an option that provides denture stability with little movement when the patient is speaking or eating. 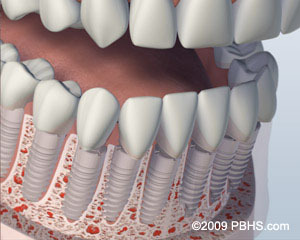 As with any implant restoration, regular hygiene cleanings and maintenance is of utmost importance. 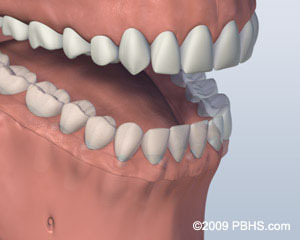 The most common restoration for the fully edentulous patient are screw retained dentures. The patient and the surgeon will decide on the number of implants (4-8), after osseointegration is achieved, patients can proceed with their final restoration with screw retained dentures. The final restoration does not involve a bar but screws that will hold the denture into place supported by the implants. The denture will be slightly elevated from the gum tissue allowing patients easy access for proper hygiene maintenance. Regular dental checkups and cleanings are necessary with screw retained dentures, the only time the denture will be removed is during hygiene cleanings and or when the Doctor needs to evaluate the implants or restoration. 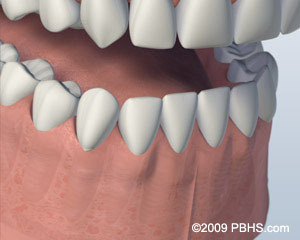 The third and final option for the fully edentulous patient is to have all teeth replaced with individual implants (8 – 10). Individual crowns will be attached to the implants and seated into the gum tissue, allowing for the appearance of natural teeth. This is the most costly option as it requires additional implants, abutments, restorative parts, and crowns to be fabricated.